at 16 South Palm Avenue near the corner of Main and Palm in Sarasota. The Giving Challenge Reception is a FREE wine and cheese social the Friday night before the Giving Challenge, bringing to life our theme of “Be the One to Support Healthy Hearing”. FREE hearing screenings via business partner All Ears Hearing Services Van on Palm Avenue in the front of the Art To Walk On venue and party. FREE audiologist consultations via business partner Adept Audiology inside to guide people on which devices are best suited for their needs. FREE designated driver service from ITN Suncoast to and from the event. 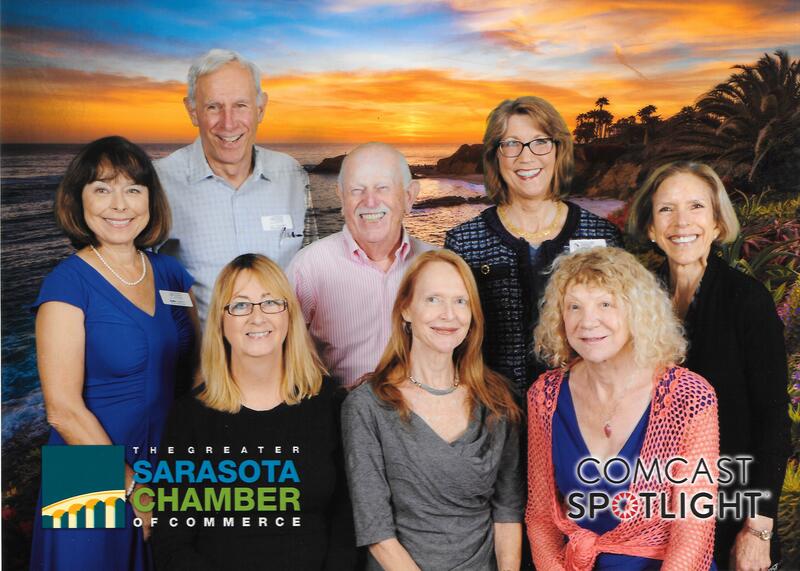 Time for guests to mingle over wine and bites with our board and discuss our programs in one of the most hearing-friendly social environments in Sarasota as the many hanging rugs help dampen the crowd noise. Be The One and Join Us! There will be FREE designated driver service from ITN Suncoast for this event!! ITN Suncoast is a nonprofit provider of rides for seniors in Manatee and Sarasota counties. To introduce the service, they have agreed to provide FREE rides to our HLAA Chapter to and from the Happy Hour on April 20 and the Giving Challenge Reception on April 27. You do not have to be a member of ITN Suncoast to take advantage of these FREE offers. To arrange a ride, call 941-364-7530. Website is at: http://www.itnsuncoast.org. LET’S ALL RETURN TO THE MOVIES! Movies are really loud but that does not cut it for speech recognition. Now, “understanding words” is no longer an excuse to avoid the movies. With the HLAA negotiated Department of Justice 2017 Rules, movie captions are mandated at most movie theatres in the USA (see “READ MORE” for the Rule and exceptions). Captionfish at Captionfish.com lists every movie screen in North America that is captioned with the show times and even advises if captions are CV-DV (viewer with support arm in cup holder) or SONY-DV (Sony eyewear with infrared captions). Our Private Eyes Movie Club meets on fourth Tuesdays at the Hollywood 11 Theatre on Main Street, Sarasota (third Tuesday this month). See “Private Eyes” near the end of Listen! Up for all the information. The new rules apply only to movie theaters that have the ability to show movies in a digital format. Movie theaters that have captioning devices now, must, as of January 17, notify the public about the devices and have staff to assist patrons with the devices. Movie theaters that have been providing digital showings of movies since December 2016 but don’t yet have captioning devices have until June 2, 2018 to come into compliance. Theaters must have a minimum number of devices available based on the number of screens they have: for one screen, they must have a minimum of four devices; for 2-7 screens, six devices; 8-15 screens, eight devices; 16 or more screens, 12 devices. The rule does not require a movie theater to provide open captioning. However, a theater may choose to do so. 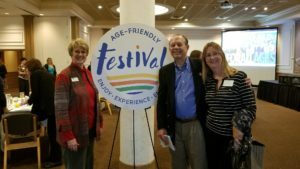 Chapter Trustees Ed Ogiba and Vinell Lacy attended a January event sponsored by Age-Friendly Sarasota. 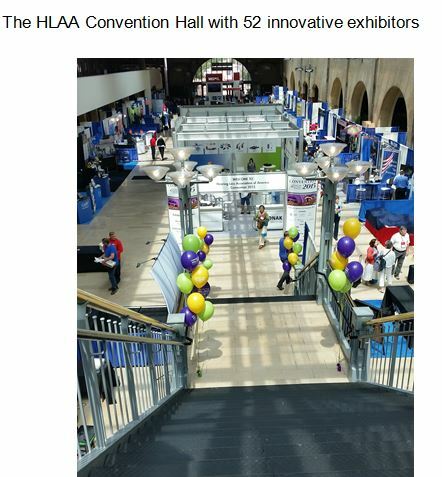 Our HLAA Chapter has become involved in the Age-Friendly mission and exhibited at the recent Age-Friendly Festival. Vinell Lacy and Ed Ogiba met with Debra Jacobs, the CEO and President of The Patterson Foundation, whichcreated and sponsored the Age-Friendly Sarasota Festival. 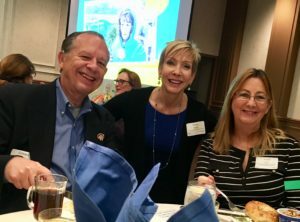 The purpose of the breakfast was to bring together the nonprofits that were at the first Age-Friendly Festival in America in October, and encourage them to be more creative in partnering with each other. Ed and Vinell connected with ITNSunCoast leader Stacy Prouty and we are already exploring ways to partner, starting with the Hearing Tech Expo later this year. ITNSunCoast will help support attendance by offering free rides to and from the expo to anyone in the two counties who needs them. Our leaders also met with Debra Jacobs, the CEO and President of The Patterson Foundation, who hosted the Age-Friendly Festival. The Foundation will help us to identify new health and wellness organizations to add to our expo’s line-up. Vinell and Ed connected with Stacy Prouty of ITNSunCoast which will sponsor our Hearing Tech Expo by offering attendees free rides to and from the event. Our Happy Hours are “meet and greet” get-togethers for folks that normally avoid happy hours, since they can’t hear any conversation. Happy Hour, not to be confused with our educational “After Hours”, is subject to call and we have been called. Stop by after work or on the way to dinner or a show. No reservations required. We will gather on Friday, February 23, at 5:00 PM in a private room – without overhead music – at Barnacle Bill’s on North 41 … 5050 N. Tamiami Trail in Sarasota. Our Chapter participated in the “Age Friendly Festival” at the Fairgrounds on Fruitville on October 28. The event was very successful with hundreds of volunteers and thousands of attendees. 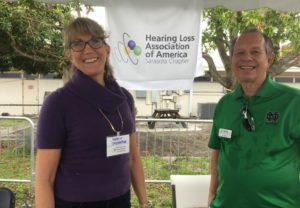 Trustee Mark Selis had his All Ears hearing van parked adjacent to the HLAA Chapter’s booth and was busy with free hearing screens the entire day – 45 screenings completed! 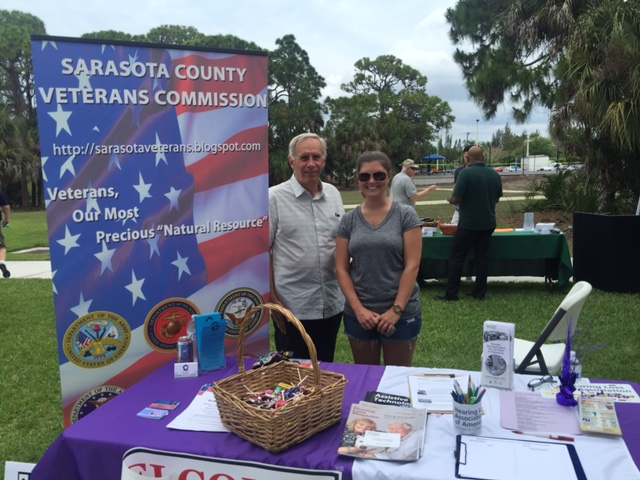 Chapter veterans Valerie Stafford-Mallis and Ed Ogiba manned the booth all day making many contacts while passing out all the literature, magazines and handouts we had. 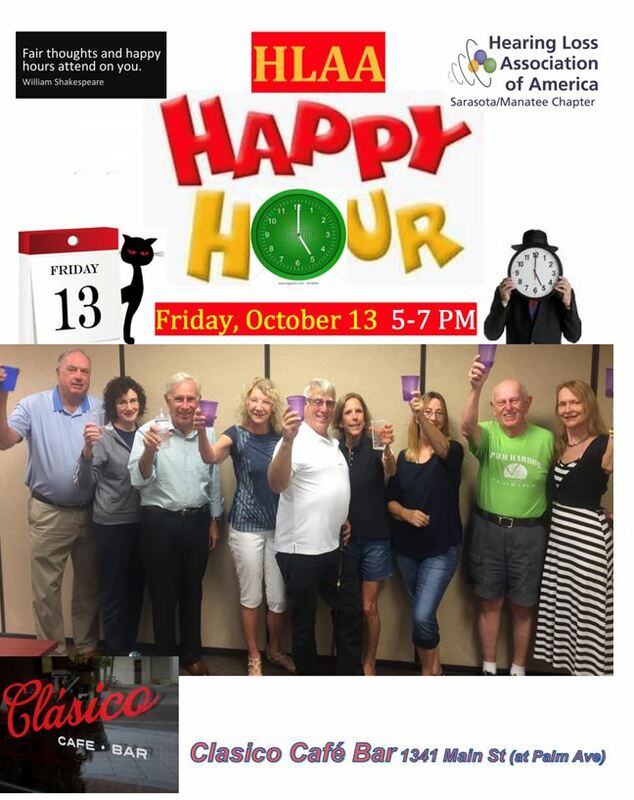 Our Happy Hours are meet and greet get-togethers for folks that normally avoid happy hours, since they can’t hear any conversation. 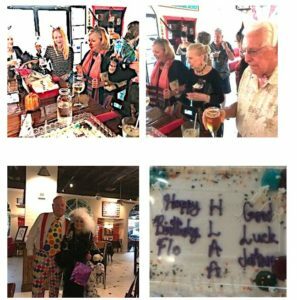 That did not stop 20 Chapter members from celebrating JoAnne DeVries “retirement” as Chapter President and Flo Innes’s birthday. Happy Hours are subject to call anytime. Here are some candid shots from October’s Friday the 13trh get-together. 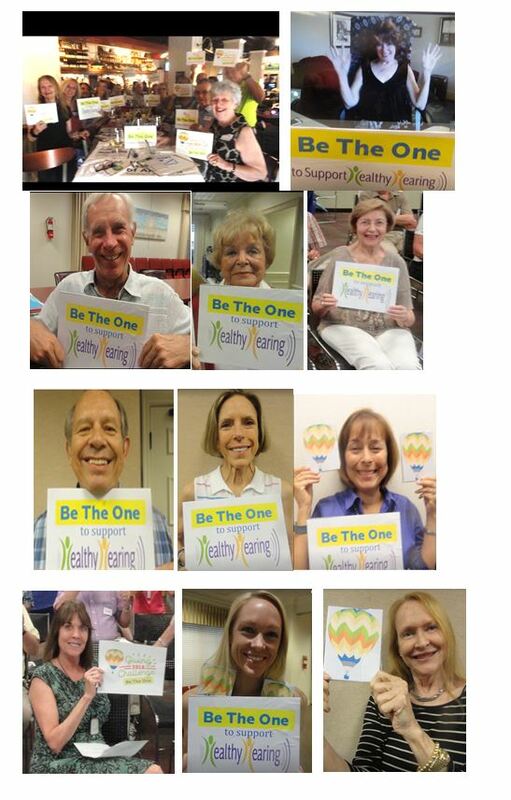 Hearing Loss Association of America, Sarasota/Manatee Chapter!! 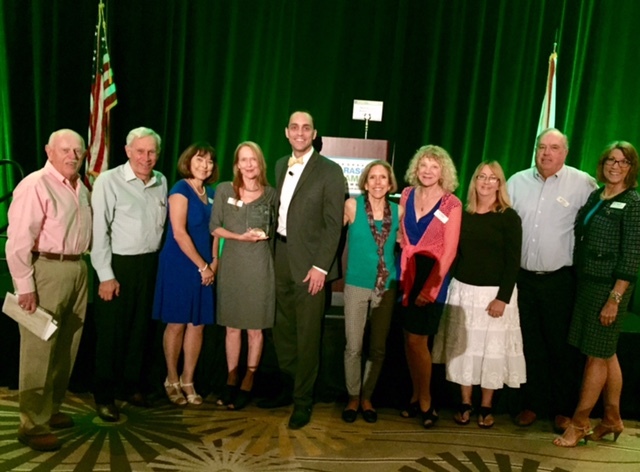 The 27th annual Frank G. Berlin Small Business Awards were awarded by the Sarasota Chamber of Commerce during a luncheon at the Hyatt Regency on Friday, June 2. The Chapter was announced the winner in the category of Health Care and Wellness with two other finalists, Gulfcoast South Area Health Education Center and Dr. Thomas Bowles, DDS. Four hundred of Sarasota’s business leaders were present for the annual award banquet. The Chapter was well represented with nine Board members in attendance. From left to right–Chapter Board members Shelly Zelizer, Dave Donnelly, Kathy Combs, JoAnne DeVries, Chamber CEO Kevin Cooper, Chapter Board members Maria Anderson, Anne Taylor, Vinell Lacy, Richard Williams and former National Board member Valerie Stafford-Mallis were all present for the award. 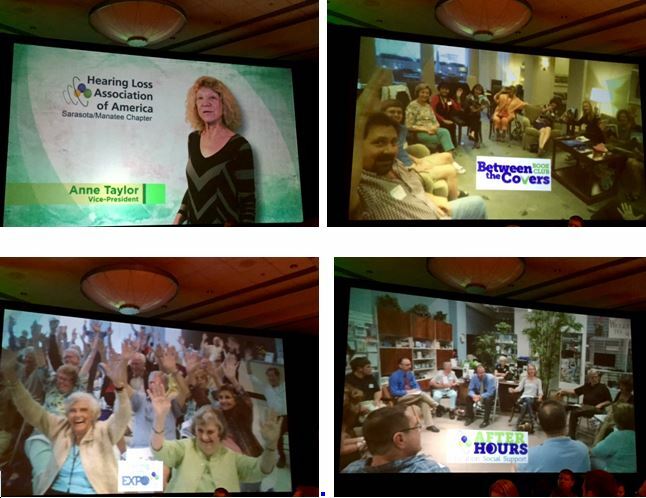 Anne Taylor narrated the Chapter’s video highlighting the HLAA mission of Information, Support, Education and Advocacy and showing slides from the Chapter’s Expo, Private Eyes Movie Club, Between the Covers Book Club, Private Eyes Movie Club, the Walk4Hearing, After Hours and Chapter Meetings. “Not surprisingly, entities with the most at risk over any impending changes to current hearing aid regulations voiced the most vehement opposition to regulatory change and offered strong support the 2013 FDA Draft Guidance. The Hearing Industries Association (HIA), the national trade association of hearing aids and other associated products, emphasized the apparent risks associated with Do-It-Yourself (DIY) solutions, like PSAPs. ..Citing survey data from their members outlining the risks associated with purchasing PSAPs without first seeing a hearing professional to rule out a medical complication, the International Hearing Society (IHS) offered similar opposition to the PCAST recommendation of the creation of a new category of over-the-counter hearing aids, and support for the adoption of the 2013 PSAP Draft Guidance…. Similarly, Amplifon Americas, with hundreds of Miracle Ear and Elite Hearing Network locations around the U.S. issued a 70 page tome opposing any changes to the 1977 FDA regulations. On the other end of the spectrum, advocacy groups such as AARP and HLAA focused on affordability and accessibility issues in their public comments. Stating that the 2013 Draft Guidance is a barrier for innovative hearing technologies coming to market, in their public comments, AARP urged the FDA to withdraw their PSAP guidelines because they create unnecessary limits to consumer access. The Hearing Loss Association of America (HLAA) echoed similar sentiments in their public comments, stating they supported the PCASTs recommendation of creating a new category of “basic” over-the-counter hearing aids. Consistent with consumer advocacy groups, the Consumer Technology Association (CTA) offered strong support for the PCAST recommendations. Perhaps the most eye-opening public comments came from consumer audio giant, Bose. Using dozens of citations from the hearing science and audiology literature, Bose built a case for the safe and effective use of over-the-counter hearing aids for a wide variety of hearing losses – beyond “basic” hearing aids for mild to moderate age-related hearing loss. In contrast, ADA expressed concerns over the FDAs “intended use” doctrine, which is part of their 2013 Draft Guidance and backed a change to regulating devices around their “actual use”. In their public comment, ADA offered qualified support for the creation of a new category of direct-to-consumer hearing aids. In summary, opinions typically coalesced around two camps: Those that believe the harms associated with direct-to-consumer devices outweigh affordability and access issues, thus the status quo should remain relatively unchanged. The second camp, alternatively, tends to believe affordability and access trump any potential harm caused to those choosing not to see a professional prior to purchasing traditional hearing aids. People with hearing loss (PWHL) know they want to hear better, but believe they don’t always get what they need from the professionals. And after all, they’re the ones struggling to hear. Is the process too complicated, too divisive? Maybe the professional and the PWHL should hold hands for a little while when they come together and see where that takes them. When I give presentations to university and college students who are training to be hearing care professionals, I’m there as a real, live PWHL. I stand in front of motivated, intelligent people looking forward to a satisfying career that will help people and pay the bills. They have learned their profession’s scope of practice and intend to honor it. So, in my various presentations, I use humor and drama, Power Points, promises and thinly veiled threats to help them get under the skin of the real people they will be serving. Will my words and their professors teachings stick with them when, as new professionals, they feel the shock of reality with fee schedules that don’t include the necessary client counseling, and the corporate pressure to sell? Perhaps the course needs to drill down, be more elemental? Voila! The World’s Shortest Audiology Course. Close your computers please and look at me while we talk. Your clients will need the same courtesy. I’ll follow up with a print or electronic version; you should do the same for your clients after every appointment. Paint the Big Picture. The journey to communication success is a partnership and both professionals and PWHLs have roles. Explain yours and explain your vision of theirs. Ask if they have a different vision. Come to an agreement. Write it down, spit in your hands, and shake. Learn all the technical stuff about Audiology and Technology and then articulate the important bits to your clients. Don’t dumb it down or Einstein it. Keep it real. Communicate better. Even if people say you already speak well, learn what your clients need and then deliver. Face them when you speak. Always. No exceptions. Speak clearly, maybe a bit louder, don’t over-emphasize. The message in your eyes is as important as the words on your lips. Practice in front of a mirror and with a PWHL. Ask for feedback from professors and friends. Am I loud enough (but not too loud)? Do I speak clearly? Don’t assume. Ask questions. It’s easy to believe, by virtue of your diploma, that you’re the expert on what your client should want. How can you be? You’re not them. Ask what’s important in their life. How has hearing loss affected them? What would they like to see changed? Can they afford standard hearing aids? Be a scientist and never lose your curiosity. Explore alternatives. Be patient. Walk in your clients’ shoes. Learn what they must learn—the other communication strategies that complement technology. Become artificially hard of hearing for a day or two to understand the challenges in understanding speech, hearing your baby cry or coping in noise and groups. Use closed captioning for a month. Take a speechreading course. Use the peerless peer support of consumer groups such as HLAA and CHHA. Wear an amplification device for an explosive revelation at what your clients really endure as they get used to new hearing aids. Loop your office. The whole thing. 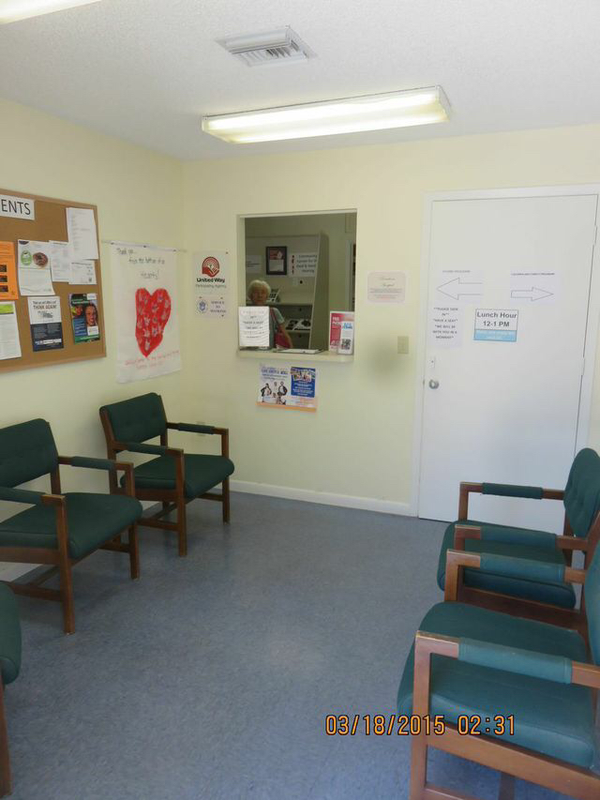 The front reception desk and the client interview/fitting rooms—but not the sound booth. Then—use a transmitter to connect with your client. Of course, to do that, you will need to put telecoils in your clients’ hearing aids. Explain why they need them and how the system works. Bluetooth is wonderful: it connects clients to their phones, TV and other devices. Telecoils and looping connect them to YOU. Compliment your clients on their achievements, however small, and encourage them through the setbacks. Smile and make them want to smile back. Admit it. Get help. Use technology and other strategies. Tell people what you need. Communicate. Repeat as necessary”. Our Professional Partners continue to give back to the community. Dr. Mary Thorpe and her staff at Hear Care Audiology Center hosted a “Wine & Stein Fundraiser” on Thursday, April 21. The event was held at the beautiful Gold Coast Eagle Distribution facility in Lakewood Ranch and was a fun filled evening. There were appetizers and Silent Auction Items along with Gold Eagle’s beverages. 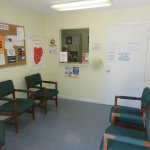 Dr. Thorpe has formed a local 501-(c)-(3) not for profit organization, “Hear Care Connection”, to create a nonprofit hearing clinic in Sarasota County. 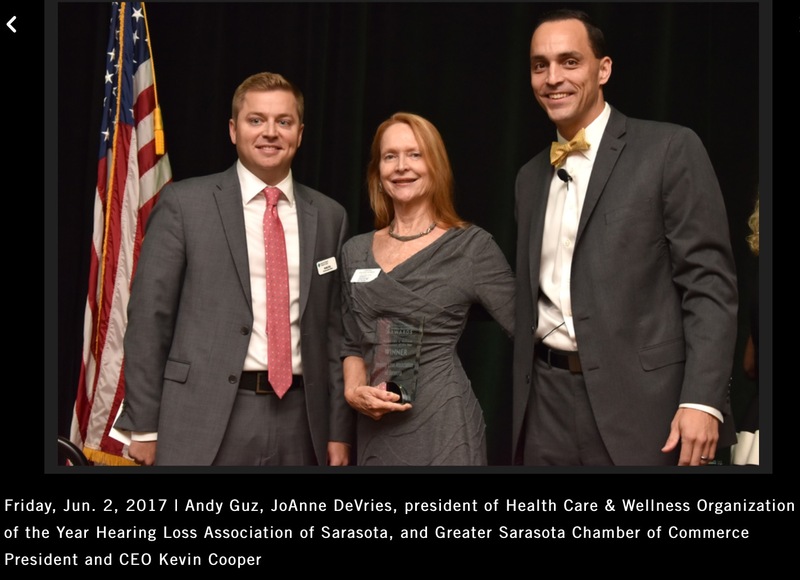 The purpose of the fundraiser was to help launch a reduced-fee, sliding-scale nonprofit hearing clinic in Sarasota County. HearCare Connection has served nationally for over four years reaching more than 500 people with the Gift of Hearing. Over 220 generous community members attended to help “build the self worth of individuals by restoring their hearing potential and providing them with opportunities to engage with their communities through service to others””. Good news! Remote Conference Captioning (RCC), also referred to as Relay Conference Captioning, is currently available through Sprint Relay to Florida residents. It uses human real-time caption writers and not speech recognition software. It does not matter where the conference call participants live nor in what state the conference call dial-in is located. All that matters is that the person requesting the call is a Florida resident with hearing loss and that the person uses a land line with a Florida phone number, because the Florida relay service is paid for by a tax on monthly landline bills in Florida. When the person requests the service, they will input their landline phone number as a part of their identifying information. The words are read online in a closed link that only the participants share. If you are hard of hearing and need to “meet” with others for business or a group you belong to—or even a telephonic family get together, you can have CART “free”! Lip-reading classes at ACE (Adult Continuing Education) will be held at the Technical School on Proctor and Beneva in Sarasota. They will begin on October 5th and end on December 7th with no class the Wednesday before Thanksgiving. The classes begin at 10 am and end by 12 in room 205. All students must register at the ACE office either by phone, e mail, or in person. Contact the ACE office at 941-361-6590. “Tess Talk!” – a live radio show – will make its debut on Saturday April 2, 2016 on WTIS-AM 1110 at 11 AM. Tess Crowder covers our Chapter Meeting CART captioning when Jack and Dee Boenau have schedule conflicts. She is a past President of HLAA-Florida State Association. Each show will feature inspirational and uplifting stories which will warm your heart, motivate you, and inspire you to reach your full potential in your personal and professional life. She will also interview guests who are doing great things in our community and all around the nation. Each week she will feature a non-profit, charitable organization to help spread awareness in our community about their programs and services and create support for their cause. (5)(a) A hearing aid office must have available, or have access to, a selection of hearing aid models, hearing aid supplies, and services complete enough to accommodate the various needs of the hearing aid wearers. (b) At the time of the initial examination for fitting and sale of a hearing aid, the attending hearing aid specialist must notify the prospective purchaser or client of the benefits of telecoil, “t” coil, or “t” switch technology, including increased access to telephones and noninvasive access to assistive listening systems required under the Americans with Disabilities Act of 1990. History.—ss. 11, 18, ch. 83-153; ss. 1, 7, ch. 84-94; s. 1, ch. 85-262; ss. 11, 19, 20, ch. 86-283; s. 22, ch. 90-341; s. 11, ch. 90-345; s. 4, ch. 91-429; ss. 250, 335, ch. 94-119; s. 8, ch. 94-160. Hearing loss is still a neglected issue, even though the figures speak volumes: more than 15% of the adult population is affected by hearing loss, and around half of these cases could have been avoided by taking preventive measures. Some 665,000 children with significant hearing loss are born every year. One of the biggest challenges is that 80 percent of people with hearing loss live in low- to middle-income countries and often do not have any access to audiological or medical care. In low-income countries, for example, only one in 40 people with hearing loss wears a hearing aid. This has serious consequences: children with untreated hearing loss, particularly those living in these regions, have hardly any future prospects. After all, children who cannot hear very well have difficulty learning to speak, which reduces their chances of receiving an education and developing at an appropriate rate for their age. Hearing aids as well as audiological and medical care would remedy this. However, access to these remains beyond the grasp of most families. The Hear the World Foundation actively supports and promotes projects that provide help for people with hearing loss to enable them to enjoy a better quality of life. The foundation also draws attention and raises awareness of the issue of hearing loss by carrying out studies and campaigns. Support is provided via financial resources, the provision of hearing systems or the deployment of one of the foundation’s own teams. Sonova bears all of the foundation’s administration costs to ensure that 100 percent of all donations go directly to the projects. I listened carefully, conducted a new hearing test, and ran real-ear measurements to see how much amplification she was experiencing. After I did that, I could hardly control my excitement! Jessica’s lifestyle and the degree of her hearing loss were perfect for a miracle! Looking at her hearing aid fitting and knowing the capacity of new hearing aids, I could see many ways to improve her hearing dramatically. With a little luck and a lot of work, we could make this miracle happen. Let’s examine this patient’s numerous hearing needs, one by one, and then present solutions to address each of them. • Hearing distant voices: As a teacher, Jessica needs to hear students speaking from the back row of the classroom. That requires markedly increasing the bandwidth in program #1, as discussed in Judy’s story. • Noise reduction so she can converse in the cafeteria: Employ narrow-zone hearing, using a microphone array set to the minimum field in program 2 or 3. Occluding ear molds act as noise plugs. This was discussed in Kim’s story. • Singing in the choir: Create a special music program with a smooth response. Use minimum automatic gain control (AGC) settings, and de-activate most automatic features. Details are discussed below. • Listening to music from her IPad: Connect her streamer to her IPad by wire. Create a music program. • Using a cellphone: Connect Bluetooth to her streamer, with the microphones de-activated. Discussed in David’s story. • Watching television: Increase bandwidth. Discussed in Judy’s story. • Tolerating the barking of her brother’s dogs: Use the noise-reduction program, and set the AGC carefully. Discussed below. If you have read the previous installments in this series, you know how most of the miracles that Jessica needs can be provided. Earlier posts discussed bandwidth, noise reduction, and cell phone use. But we have not talked about listening to music through hearing aids, so let’s do that now. Most high-tech features in hearing aids are designed either to help patients understand speech or to keep them comfortable when they are using amplification. When used appropriately, these features are wonderful. However, they are worse than useless in a hearing aid music program. If you leave these features on, they will distort the music. Programming hearing aids is not a job for an amateur, nor can it be done effectively automatically using “first fit” software. The professional adjusting the hearing aids has to know what he or she is doing. Our last task was solving the “barking dog” problem. For this, Jessica uses her hearing aids’ noise-reduction program to reduce environmental sounds. In addition, I took great care in selecting the AGC settings (thresholds and compression ratios) to ensure that the loud barking would no longer be intolerable for her. Leanne Browning, our 2014 intern reports she has been “crazy busy”. She is an FSU graduate and attending James Madison University in Virginia for her Au. D.
The State Board updated the Bylaws, adopted a Strategic Plan, and addressed the website, fundraising, recruitment of Board members and other business. The Board agreed that the day was productive and celebrated with Chapter member and hostess, Flo Innes. The HLAA-Sarasota/Manatee Chapter’s Board met on June 9 to cover many agenda items. They included updates on the Publix initiative, the Giving Challenge and the Convention. Discussions and reports included the Governance Committee which is working to restructure the nominating process and committee responsibilities. Fundraising and membership efforts were discussed. Amendments to Bylaws to permit electronic voting and provide for a student Board member were approved. Program services and outreach programs were addressed as well as preparation of a member survey. Planning for the 2014 Expo was also covered. The Chapter’s Board is all volunteer and has a full plate as always. 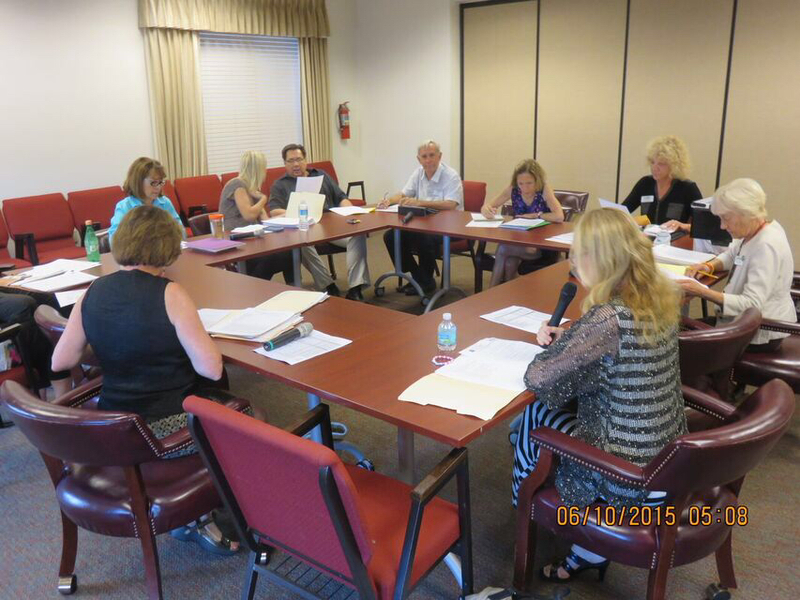 HLAA-Sarasota/Manatee Chapter has officially moved in to its spacious “closet”. The price is right thanks to the donation of the Community Center for the Deaf and Hard of Hearing (CCDHH) for Manatee and Sarasota Counties is located at 1750 17th Street in Sarasota. 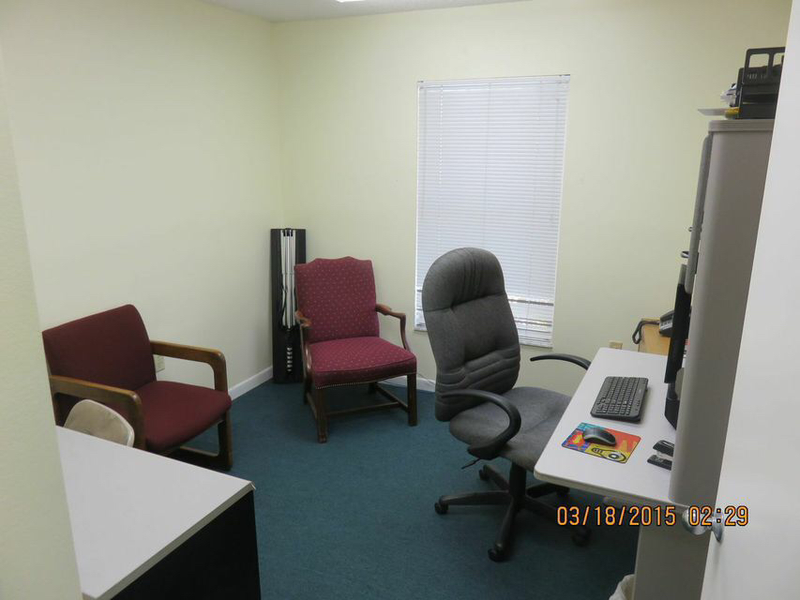 They had a small office that was not in full use and an agreement was reached for HLAA-Sarasota/Manatee Chapter to use this space—for free! CCDHH, a non-profit 501(c)(3) organization. CCDHH offers services and programs for deaf, hard of hearing, late deafened, deaf blind, speech impaired, and hearing individuals making communication possible for all in our community. CCDHH serves the residents of Manatee and Sarasota Counties with the main office located in Sarasota and a branch office in Venice. Our new Chapter intern is Renee Eicher. Renee, a Bradenton resident, is completing a second bachelor’s degree. She was introduced to the profession of audiology in the midst of obtaining her first bachelor’s degree from Florida Gulf Coast University. She registered for an American Sign Language course as an elective and was instantly engrossed by the language. She now has a major at the University of South Florida in Communication Sciences and Disorders. She observed two audiologists at Silverstein Institute and the observations solidified her excitement for the profession. 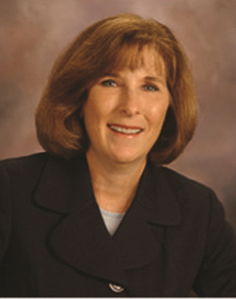 Her work with the Chapter will be a great asset for Sarasota and Manatee County residents with hearing loss and will help her to further understand the daily inconveniences we members deal with daily. May is Better Hearing and Speech Month (“BHSM”). BHSM encourages parents and grandparents to identify possible speech and language problems in their children which can affect a child’s learning and self esteem. BHSM educates people about the signs of hearing loss. • Turning an ear in the direction of sound in order to hear it better. • Understanding conversation better when you look directly at the person. Seeing their facial expression and lips movements can help a someone understand another better is there is a hearing problem. • Being unable to hear all parts of a group conversation. • Experiencing pain or ringing in the ears (tinnitus). • Listening to the TV or radio at volume levels higher than other people normally listen to. If any of these signs are displayed, a person can take action by visiting an audiologist for a hearing test. An audiologist is a health professional who specializes in diagnosing and treating people with hearing problems. In most cases hearing loss is treatable. Audiologists can teach their clients to concentrate on listening to certain sounds. Hearing loss can often be overcome using either hearing aids or other assistive learning devices. The Chapter has grown and outreach efforts have brought about boxes and boxes of materials to store and for our many volunteers to use at events. The business of the all volunteer HLAA chapter has taken on daily responsibilities. The Board has recognized that storing boxes and materials in homes is not viable and that a business environment is necessary to conduct business as well. The Community Center for the Deaf and Hard of Hearing (CCDHH) for Manatee and Sarasota Counties is located at 1750 17th Street in Sarasota. 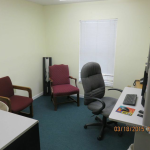 They had a small office that was not in full use and an agreement was reached for HLAA-Sarasota/Manatee Chapter to use this space—for free!